KUALA LUMPUR (Nov 10): The FBM KLCI rebounded as local funds attempted to fill in the void left by foreign selling last week. At 5pm, the KLCI rose 3.74 points or 0.21% to settle at 1,827.93 points as stocks like Sime Darby Bhd and SapuraKencana Petroleum Bhd advanced. Last week, the KLCI's losing streak saw the index fell by a cumulative 30.96 points or 1.67& to end at 1,824.19 on Friday. Today, Lee Cheng Hooi, regional chartist for Maybank Investment Bank Bhd said the KLCI was lifted by positive regional sentiment, while local funds had done some bargain hunting after last week’s foreign selling. “Initially, the market got a lift from the buoyant Hong Kong market. Also, local funds probably bought some oversold stocks up after the whole of last week’s foreign selldown,” Lee told The Edge Markets.com. Bursa Malaysia saw 2.66 billion shares worth RM1.98 billion exchanged. 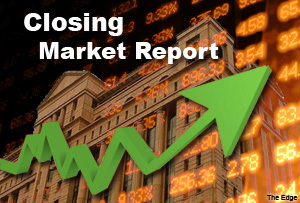 Market sentiment was still bearish with 482 decliners against 348 gainers, while 299 counters were unchanged. Aeon Credit Service (M) Bhd led decliners, while Asia File Corp Bhd headed gainers. The most actively traded stock was Nova MSC Bhd. Across the region, Hong Kong’s Hang Seng rose 0.83%, South Korea’s Kospi gained 0.95% while Japan’s Nikkei was down 0.59%. Reuters said Asian shares gained on Monday after U.S. jobs data pointed to solid economic growth, with Hong Kong leading the gains after regulators set a date for a long-awaited trading link between the Hong Kong and Shanghai stock exchanges to open.